I found the cure the other night for all things cynical sitting in the Dorothy Chandler Pavilion at the Gala Bel Canto while the Los Angeles Children’s Chorus sang about Winnie the Pooh and his tummy. All ills cured—any trace of a scowl—erased. That night the group also honored the Oscar and Grammy Award-winning songwriters Kristen Anderson-Lopez and Robert Lopez for writing the catchiest, most heartfelt tunes in ages from the film Frozen. John Lasseter got up to make the room even warmer and fuzzier, “The greatest day in my career is when they played the demo of ‘Let It Go.’ ‘Let It Go’ had it all. We reworked the entire story of Frozen around that song.” The Lopezes got up to accept the award (that last time I ran into the duo was backstage at the Oscars and Robert had an EGOT necklace on made of dry macaroni). Kristen Anderson-Lopez spoke for the couple, “I’ve been in 20 choirs since I was a little girl and I’ve learned that most good boyfriends come from the bass section and that choirs naturally lead you to your future life partner.” The couple then sang an original lullaby together. Okay, collective ahhh. Too add even more Disney magic to the evening, Grammy Award-winning composer Richard Sherman sat down at the piano to play some of his Mary Poppin’s tunes (so fab) and created a new ditty for pal LACC President/Vice Chair Edward J. Nowak (who just happens to be Deputy General Counsel of The Walt Disney Company). He also just might be the only lawyer in L.A. with a piano in his office, according to Sherman. 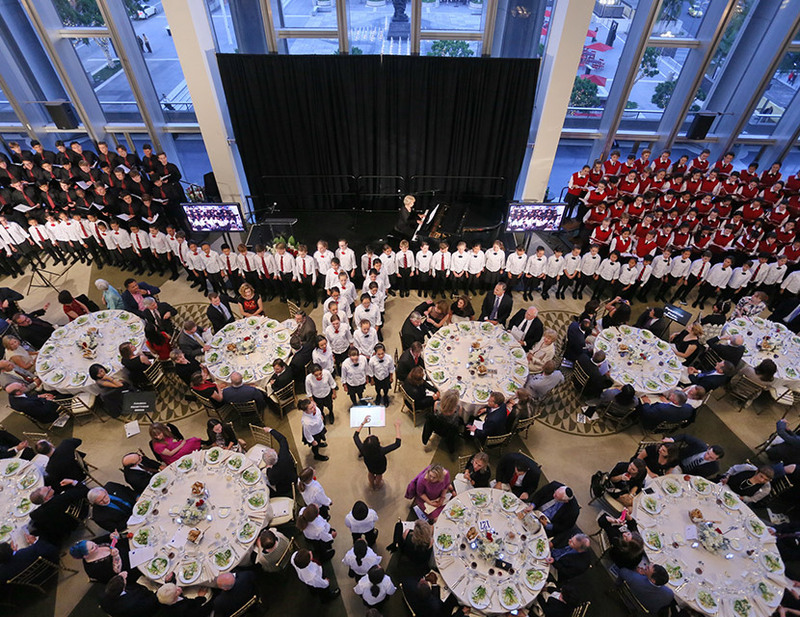 The evening raised over $250,000 for the chorus. When is the next cure taking place? The Los Angeles Children’s Chorus’s spring concerts (celebrating American song) are May 3rd and May 10th. Grab a ticket—it will be even better than a spoonful of sugar, you’ll see (and hear).